Auto Manifesto: No Volt, No Pass? GM needs the Volt for CAFE purposes. Supposedly the Chevy Volt will receive an EPA rating of 230 MPG. This is all based on funny math and creative accounting. But if we take it at face value and apply it toward GM's CAFE (Corporate Average Fuel Economy) average something dramatic happens. 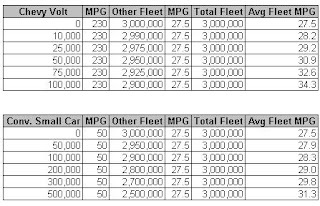 Assuming total GM production of 3 million vehicles and that its existing CAFE average is 27.5 mpg, look at the tables below and see how various Volt production volumes can impact GM's overall average. If GM could produce 100,000 Chevy Volts that are rated at 230 MPG the rest of the 2.9 million vehicles would only need to average 29 MPG to meet CAFE of 35.5 MPG. Between engine downsizing, lighter vehicles, lower drag designs and increasing consumer preference for more efficient vehicles it should be an attainable target. 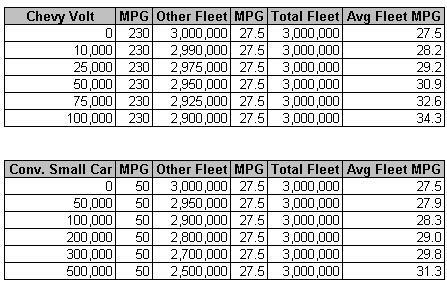 Contrast that with the second table and you can see that even if GM starts producing an efficient small car that gets 50 MPG and sells in really large numbers that it still wouldn't take the average anywhere near 35.5 MPG required in 2016. In fact the other 2.5 million vehicles GM would produce would need to average nearly 33 MPG. Despite the fact that the 230 MPG figure would be a total fabrication, I predict this will become a political exercise that promotes CAFE and perhaps a cap-and-trade program as the keys to solving our transportation greenhouse gas problems, which would be a shame because the technology is absolutely vital to the eventual transition to electric vehicles. It should be appreciated for what it is. Let's hope it doesn't fall victim to a political hijacking.